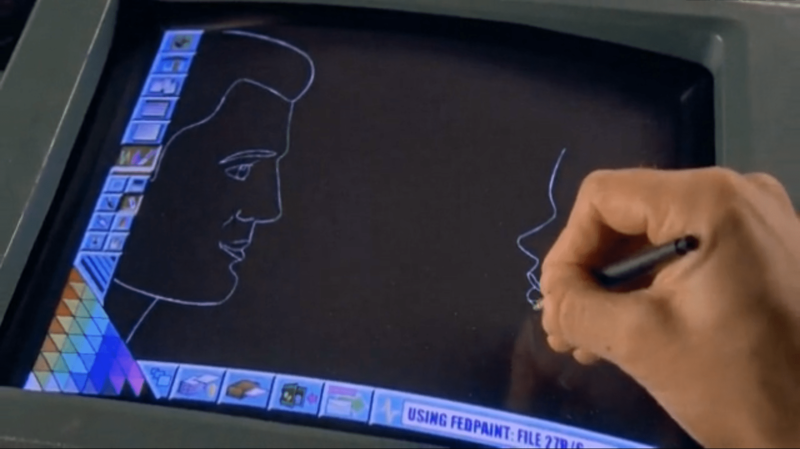 Students in Starship Troopers academy have access to desktop computing environments during class, including a drawing and animation program called “Fedpaint,” that had a number of very forward-looking features. The screen is housed in a metal bezel that is attached to the desk, and can be left flat or angled slightly per the user’s preference. A few hardware buttons sit in a row at the bottom of the bezel. (Quick industrial design aside: Those buttons belong at the top of the bezel.) 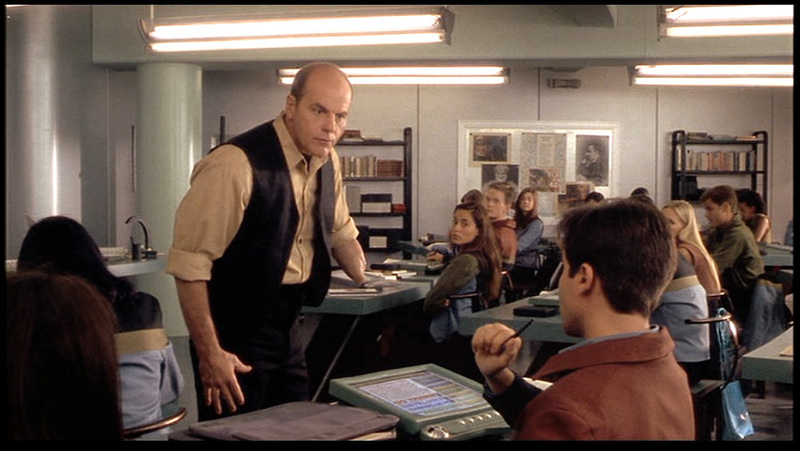 The input device is a stylus. (Styli had been in use in personal digital assistants for over a decade when the film came out, I don’t think they had been sold as the primary input for a PC.) 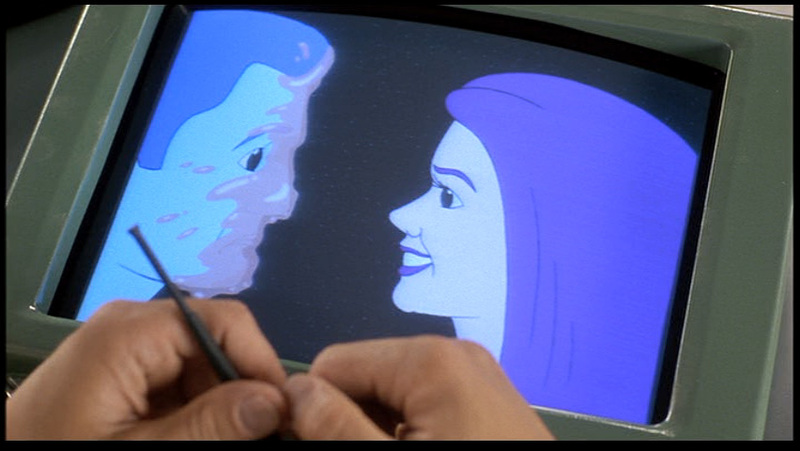 When we first see Johnny using the computer, he is ignoring his citizenship lesson and using Fedpaint instead. Using the stylus, Johnny sketches a flirty animation for Carmen. He draws each of their profiles in white lines. He then adds some flat color and animates the profiles (not shown onscreen) such that the faces get closer, their eyes close, and their mouths open in readiness of a kiss. He then sends it to her. On her desk she receives a notification. (We don’t get to see it. Was she already in the program? Did the notification jump her there?) Carmen grabs her stylus and responds by adding to the animation. She sends the file back to him. He opens it and it plays automatically. In her version of the animation, the profiles approach as before, but as they near for a kiss, the female profile blows a bubble gum bubble that gets so large it pops and covers the face of the male. What’s nice about this interface is that the narrative seems to have driven some innovation in its design. It’s half gee-whiz-circa-1997 of course but half character development as it tells us that Johnny likes Cameron, and Cameron is a bit playfully stand-offish in response. To make this work well narratively, communication of the animation back and forth had to be seamless, and that seems to be the reason we see the communication tools built right into the interface. If ever there was a case for why scenario-driven design for personas works, this is it. What’s frustrating is that they skipped over the hard part. How does Johnny apply the color? A paint bucket tool is a reasonable guess, but it’s also error prone. How did he specify the number of frames and their speed? How did he ensure that the motion felt relatively smooth and communicative? Anyone who’s worked with an animation program knows that these aren’t trivial matters, and Starship Troopers took the narrative route. Probably best for the story, but less for my analysis purposes. Still, the stylus-driven direct manipulation, the unique layout, and easy, social sharing were big innovations for the time. I don’t know that there’s much to learn from this today, since our OS metaphors have advanced enough to make this seem quaint at best, and social integration is now the norm. But credit where it’s due, this interface was ahead of its time.